Let Red Sonja quench your thirst for action! Enjoy a tall glass o’ ale (or another preferred beverage, if you’re not a Hyrkanian warrior) in official Women of Dynamite Glassware. These two (2) sturdy pint glasses celebrate vintage images of the She-Devil with a Sword, as she appeared on the covers to Marvel Feature #4 (1975) and Red Sonja #1 (1977), both as illustrated by acclaimed fantasy artist Frank Thorne! Featuring the ever-classic Red Sonja logo on the back of each glass, this two-piece set ships in a protective case. Knock one back and have an adventure! 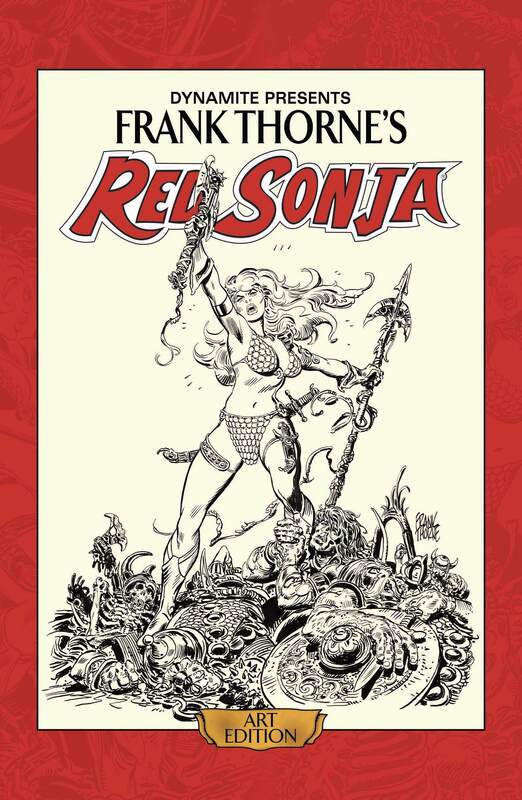 Even during the winter months, Red Sonja is no ice queen… she’s a She-Devil! Fiery in spirit, skilled in combat, lusty and bawdy in her revelry, the crimson-tressed heroine looks gorgeous and grand throughout every month of the 2017 wall calendar. Proudly display these powerful portrayals of the fan-favorite swordswoman, courtesy of the artistic talent of of Frank Cho, Joe Jusko, Greg Land, Jim Lee, Joseph Michael Linsner, Davie Mack, Esteban Maroto, Alex Ross, Marc Silvestri, Frank Thorne, Michael Turner, Mel Rubi, and more! The third and final volume in Dynamite Entertainment’s Red Sonja Art Edition line dedicated to fantasy illustration’s shining star, Frank Thorne! The defining She-Devil artist shares his original storyboards from the issue #7 through #11 of the acclaimed 1970’s Red Sonja comic book series. Scanned in high-resolution color and printed at original size, this gorgeous hardcover collection preserves every detail of the artist’s meticulous skill and hard work, while simultaneously presenting a complete storyline for all to enjoy. Limited to initial orders ONLY. Celebrate fantasy illustration’s shining star with Frank Thorne’s second Red Sonja Art Edition! The consummate She-Devil artist shares his original storyboards from the first six issues of the acclaimed 1977 Red Sonja comic book series. Scanned in high-resolution color and printed at original size, this gorgeous hardcover collection preserves every detail of the artist’s meticulous skill and hard work, while simultaneously presenting a complete storyline for all to enjoy. Limited to initial orders ONLY. One of the most unexpected but also well-deserving trends in recent years is to have anthologies which focus on the works of artists from older comics. Such anthologies have been fairly common for a long time which have focused on writers, but all too often the artists of these bygone years are all but ignored. In all fairness this has been primarily an initiative of the independent’s and this collection of Frank Thorne’s Red Sonja take a look back at this iconic character and the artwork which helped to establish her. This collection looks at Thorne’s run on the character between 1976 and 1979, a time when even the less stringent fantasy genre that Red Sonja was still seen as a bit risque, being both a barbarian and wearing a chainmail bikini. Of course the stories herein are what one would expect from the silver age, but those that only see the stories are missing the point. This is not an attempt to recycle stories which had their chance, rather this a celebration of the artist and his place in comic history. In truth the stories are not even that bad, they simply read as a little simplistic, if not as painfully outdated as what is often found in the golden age. That having been said, one of the most interesting aspects of this volume (as with many others) is the introduction, which gives a bit of history while also putting the character and creator in context of the medium. This volume will of course not be for everyone. Instead it for those interested in the history of the medium as opposed to simply reading the modern age as it progresses. It is indeed a nice addition to any library of comic history and a deserving one. When one looks to the strong female characters as they are developing in some cases in the modern day, it is important to remember that their roots go far deeper, to a time when female characters were not possible at all to lead a series, let alone any discussion about an accurate representation. Limited to 500 SIGNED copies! Celebrate the seminal work of legendary fantasy illustrator Frank Thorne with this gorgeous hardcover collection, presenting for the first time the actual storyboard artwork from his complete 1976 run of swords-and-sorcery icon Red Sonja appearances in the Marvel Feature comic book series. Scanned in high-resolution color and printed at original size, Frank Thorne’s Red Sonja Art Edition preserves every detail of the artist’s meticulous skill and hard work, while simultaneously presenting a complete storyline for the enjoyment of longtime She-Devil fans. Available with a tip-in sheet signed by Frank Thorne! Celebrate the seminal work of legendary fantasy illustrator Frank Thorne with this gorgeous hardcover collection, presenting for the first time the actual storyboard artwork from his complete 1976 run of swords-and-sorcery icon Red Sonja appearances in the Marvel Feature comic book series. Scanned in high-resolution color and printed at original size, Frank Thorne’s Red Sonja Art Edition preserves every detail of the artist’s meticulous skill and hard work, while simultaneously presenting a complete storyline for the enjoyment of longtime She-Devil fans. limited to INITIAL orders ONLY! Announced to coincide with Baltimore Comic Con which starts today, Dynamite Entertainment proudly celebrates the seminal work of a legendary fantasy illustrator with Frank Thorne’s Red Sonja Art Edition, presenting for the first time the actual storyboard artwork from his complete 1976 run of swords-and-sorcery icon Red Sonja‘s appearances in the Marvel Feature comic book series. Scanned in high-resolution color and printed at original size, this gorgeous hardcover collection preserves every detail of the artist’s meticulous skill and hard work, while simultaneously presenting a complete storyline for the enjoyment of longtime She-Devil fans. Frank Thorne’s Red Sonja Art Edition marks the first in a series of Dynamite Art Editions featuring prestigious creators and comic titles. Frank Thorne’s Red Sonja Art Edition will be solicited for retailer order through Diamond Comic Distributors’ October Previews catalog, corresponding to items shipping in December 2013. 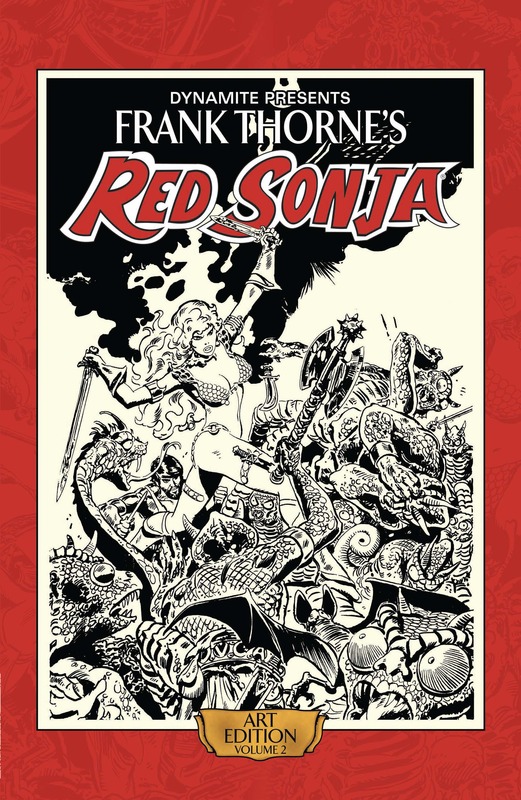 Comic book fans are encouraged to reserve copies of Frank Thorne’s Red Sonja Art Edition with their local comic book shop or hobby specialty store.